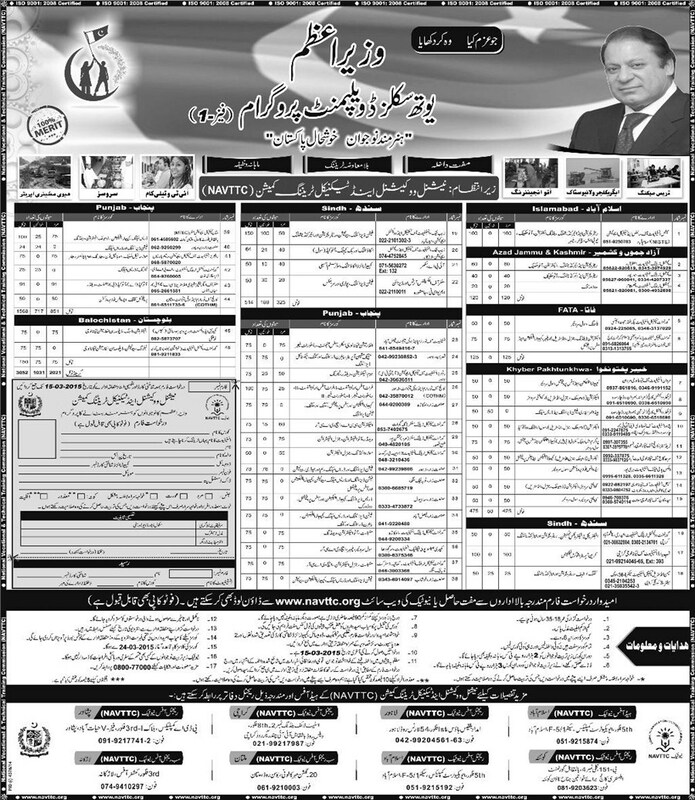 As part of Prime Minister Youth Development Program (Phase-1), the National Vocational & Technical Training Commission (NAVTTC) has invited applications from individuals who fulfill the basic eligibility criteria related to it and are interested in joining the program in order to excel their skills in various fields. So for the ease of our visitors, below we have discussed complete details about the admission form, registration procedure and eligibility criteria. According to the announcement made by the authorized department, the NAVTTC will provide free training to selected individuals in various fields including Dress Making, Auto Engineering, Services, Heavy Machinery Operative and IT. The training program has been launched simultaneously in all provinces of the country and a specific quota for both males and females have been reserved in each course. While applying for any of the available courses, do remember that all the programs have duration of 6 months and the selected individuals will be given a stipend of Rs. 2000 per month during the whole course. So all the individuals interested in joining any of the Youth Development Skills Programs, can download the application form online from the official website of NACTTC or through the link given on this page with ease. Once you have downloaded the form, fill all the required information in the given blanks and submit it to the authorized department after attaching all the required documents including attested copies of educational certificates, CNIC and two passport size pictures. Do keep in mind that the last date of application form submission is 15th March, 2015 and any application found incomplete or received after the due date will not be entertained which means the applicant will not be allowed to become part of the selection procedure. Once the registration process will be completed, the candidate will then have to appear in an interview and the ones who will clear it, will finally be allowed to join the training classes which will be began on 24th March, 2015. So download the NAVTTC training programs application form from this page and also keep visiting us on regular basis as the list of final selected candidates after the interview will also be provided over this page.